Seven o'clock on a cold, damp Saturday morning in autumn. The alarm clock goes off. It's the sort of day when any sensible person would just pull the duvet back over their head and snuggle down for at least another four hours' sleep. But not my husband. He leaps out of bed as if someone has just pressed a hidden ejector button and heads for the bathroom with a spring in his step, humming a merry tune. I should point out that this is the same man who normally has to be dragged kicking and screaming out of bed at the weekend if there's anything I particularly want to do (his excuse being "I'm just not a morning person"). So what's different about today? Oh, that's right - he's going diving. But let's get back to the subject of diving in German lakes. Maybe there's someone out there who can explain the attraction of this to me, because I certainly can't work it out. 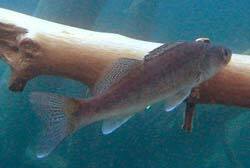 To take just one example: what is it about the fish? If you could see the sort of beautiful, brightly coloured fish that swim around at the Great Barrier Reef in German lakes too then I could understand why divers would want to see them under water. The only place I like to come across the local fish, however, is on my plate, preferably accompanied by a tasty serving of chips. Everything else that can be found in the lakes around here, such as grass, rubbish, shopping trolleys, maybe even the odd rusty old car if you're really lucky, can normally be seen without having to get wet in the process, or even having to leave the comfort of your home. That's not all, though. When I think about diving, I also have an image of a certain atmosphere, a feeling of being on holiday, which I just don't get around here, at least not in autumn or winter. Instead of muddy grass or a small stony "beach" I like to imagine long stretches of white, pristine sand, palm trees instead of birches, a beach cocktail bar instead of a small stand selling fried sausages, and the scent of coconuts on the light breeze instead of frying onions. I see what my problem is, of course: diving is only something I'd do on holiday, if at all. But for real divers, like my husband, it's a passion that's about the feeling of floating weightlessly under water rather than seeing something beautiful - that's just a bonus. Most "holiday" divers don't have this passion, and don't actually need it. 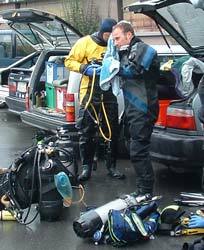 That's why the majority of divers would be unlikely to put themselves through the freezing agonies of a diving trip on an autumn weekend in northern Europe. Saturday evening. My husband is back after a rewarding day's diving. He tells me that the dives were fantastic. There was visibility of up to two metres, the group went into the icy water twice and even had a barbecue in the howling wind and driving rain. And all this in November! A wonderful day. But how else do I know that my beloved hubby is home? By the sounds coming from the bathroom: "drip…drip…drip…drip". 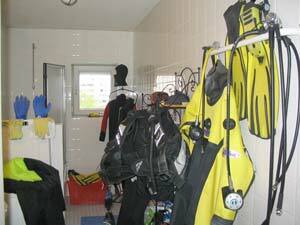 Well, all the gear has to be hung up to dry somewhere, and where better than in the bathroom? The gentle rhythm of dripping is the background, post-dive beat that will accompany us throughout the rest of the evening. OK, if I'm feeling generous I sometimes admit that I can be a little unfair when it comes to diving. At the Great Barrier Reef in Australia I did actually realise what is so attractive about the sport. This was when I was snorkelling around on the surface, knowing that there were much better things to see a few metres below me. At times like these I can even imagine myself doing a diving course. But I know I'll never have the passion you need to jump into our little local lake in the middle of winter, which means that, in Germany at least, I'll always remain a diving widow.